In 1982 a few boaters got together and had the desire to cruise the shores of New England. They weren’t interested in having a clubhouse or the expenses and responsibilities that come with it; they just wanted to get together have fun and go cruising as a group. This was the beginning of the Cruising Club of New England (CCNE). CCNE has been actively operating and cruising for 32 years. We currently have close to 100 members, and although most are from Connecticut we have members in Pennsylvania, New York, Massachusetts, and Rhode Island and even one in Vermont. 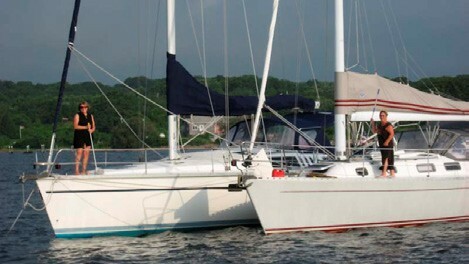 Our fleet consists of sailboats and powerboats of many makes and models, ranging from an O’Day 26 to an Island Packet 465. We are all in it for the joy of cruising, great times and good friendships. The year starts with our annual dinner meeting in March, at which an election of officers is held and the new Fleet Captain is announced. This meeting is a great opportunity for members to reconnect with good friends after a long winter. As spring rolls in and we all are preparing our boats for another season, the club holds a Spring Rendezvous, which is typically a potluck dinner. Again it is an opportunity to find out how everyone is doing and when people expect to be ready to cruise, and to socialize and have a good time. In May, destination e-mails usually start to circulate in regards to the first three-day weekend, Memorial Day. Watch Hill, RI has been the gathering place for this weekend. No formal club activities are planned for these gatherings, although that’s not to say there won’t be a last minute ice cream run, or a cocktail party on the beach. The destination for our July 4th cruise has usually been Montauk, NY. Typically, we will go all the way into the pond and anchor. We enjoy boat hopping, swimming, and the dinghy rides across the pond. The walk into town is great exercise and refreshments can be found along the way. Of course the fireworks from this location are fantastic! You may see them from multiple directions, and on multiple nights! 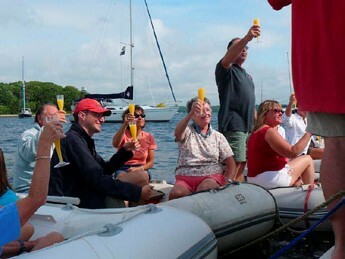 In August, CCNE sponsors a one-week cruise. The destination typically rotates annually between Long Island Sound, Narragansett Bay including Newport, and Buzzards Bay including Martha’s Vineyard. The destination for the 2014 cruise was Buzzards Bay and the Vineyard. The Fleet Captain plotted the course and the stops along the way, planned activities, and the date and location for the club dinner ashore. The registration forms are emailed and members reply and send in whatever deposits maybe required, whether it be for slips or moorings, or excursion reservations. The cruise officially starts on a Sunday, which gives members time to reach the first destination. This year, the rendezvous port was Monument Beach at Phinney’s Harbor and there were a total of 24 boats the signed up for the cruise. For some members, this was the longest leg. Although a few boats were able to get an early start, others left on Saturday and had a long day of bad weather. On Sunday, the first day of the cruise, a total of six boats made it to Phinneys Harbor. Most of the fleet opted to spend another night in Cuttyhunk after a day of bad weather. Phinney’s is a beautiful, peaceful harbor and a great place to relax. We all gathered on one boat and shared conversation and appetizers. The boaters that arrived early and were there on Saturday went ashore to The Lobster Trap for dinner. On Monday, we all rendezvous at the next port, Red Brook Harbor. We spent the morning catching up with friends and preparing for the appetizer contest. That afternoon we gathered at Parker’s Boat Yard for the contest, followed by a club-sponsored cookout. Many nice prizes were handed out for the best appetizers. Day 3 was a Lay Day. The only planned activity was a dinghy race. You were free to do what ever you wanted; just relax, read a book, boat hop, go to shore, shop, or whatever – it was your choice. Most people did not want to miss the dinghy race, as it always proves to be a lot of fun and laughs, and this one didn’t let us down. Only two people were allowed in each dinghy, with one rowing and the other giving directions, and of course the rower had a brown paper bag over his or her head, complete with a funny face drawn on it. The only rules were the bag needed to stay on, you had to round the mark, and you had to finish with both people in the dinghy. When the whistle blew the laughter started. The day ended with a beautiful sunset and many enjoying the outdoor patio at The Chart Room. On Wednesday, Day 4, the club sailed to Vineyard Haven, destination Lagoon Pond. As we arrived we had to either grab a mooring if one was available or drop anchor, as the bridge was not due to open for at least an hour. The Fleet Captain finally requested we all line up, since the bridge was going to open when we were ready. I wonder how long it took for 20 boats to go through the bridge…I say 20, as we had a few boats stay on the moorings outside of the bridge. The rest of the week was spent in Vineyard Haven. There were a few activities planned for those that wanted to participate, such as a kayak tour and clamming, and of course there was a lot of swimming. Some groups took buses to Edgartown and Oaks Bluffs for some shopping and sightseeing. Friday night was the Club dinner at the Black Dog Tavern in Vineyard Haven. The food was good and the company better. 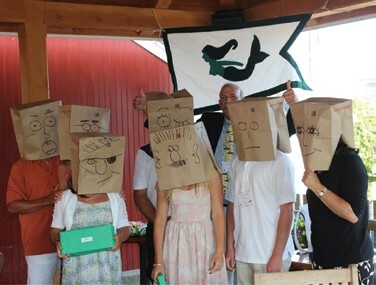 The Fleet Captain awarded the prizes for the dinghy race, although the winners had to wear their paper bag faces to collect their prizes. There were a few more prizes given out, a lot of laughs and an overall good time for all. On Saturday, some members chose to head back to their homeports and to break the trip up by stopping in Point Judith, or Block Island, while one boat headed to Nantucket and the rest finished out the week and extended the trip for another week. September brings Labor Day, and again destination e-mails start to circulate. Coecles Harbor on Shelter Island, NY is the destination. This is another quiet anchorage. Rams Head Inn is a dinghy ride away for a nice dinner. The harbor offers a lot of little nooks and crannies for gunkholing, or you can arrange for a taxi to pick you up at the dinghy dock and hop the ferry to Greenport. We have even hooked up with another group there and did a dinghy drift which proved to be a lot of fun. This brings us to the end of the season. The last event of the year is the Fall Brunch. This is a catered event, so it’s just come and enjoy. Although this is the last official meeting for the year, that’s not to say there might not be a house party or two during the winter months. After all, it’s always nice to be with friends. 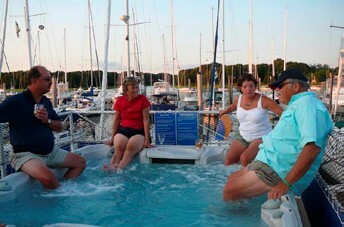 Boaters like to socialize! If you like to cruise with others and would like more information on CCNE, please contact Commodore Andy Baker at 860-428-2043 or visit cruisingclubne.org. 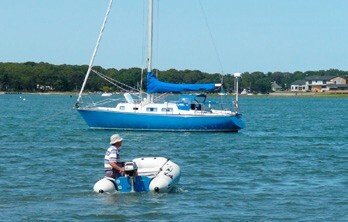 Andy Baker is the Commodore of the Cruising Club of New England. Recently retired from 30 years of service in the U.S. Air National Guard, Andy is a Managing Broker at Springline Yacht Sales in Mystic, CT. He races on Wednesday nights at Thames Yacht Club in New London and owns a Hunter 460.